Skip the Entry Line to the Széchenyi Spa and have a relaxing spa day! Delve into the world of spas with the largest thermal bath in Europe and enjoy the wide variety of its facilities any time of the day, whole year round! The Széchenyi Spa is one of the greatest prides of Budapest with its immense size, majestic appearance and huge popularity. Having 15 pools indoors and 3 open air bathing facilities the spa is considered the largest in the whole continent. The bath’s real peculiarity is its largest outdoor thermal pool with a consistently 40°C water providing magnificent recreational pleasures in the coldest days of winter as well. Just imagine floating in a huge pool of healing water while snowflakes melt away on your body and piling up everywhere else around the pool. 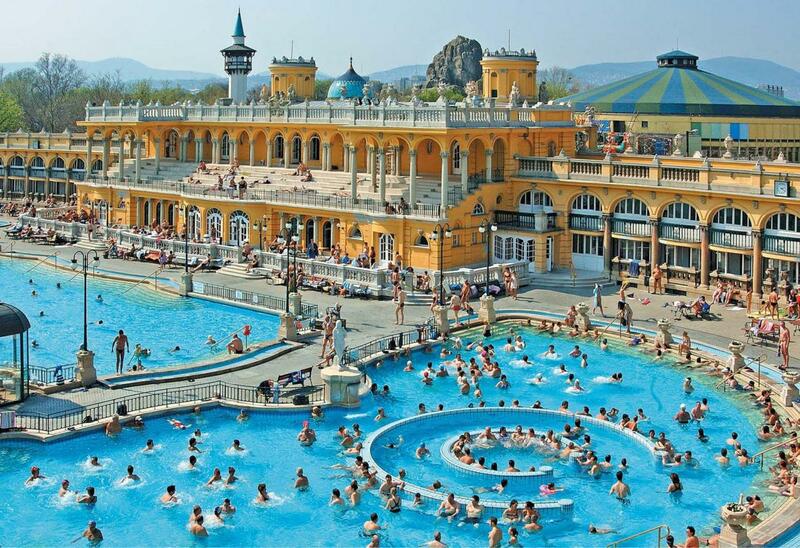 The Széchenyi Spa is feeding from the city’s extended thermal spring network running below our feet. This hidden treasure have been attracting various settlers and cultures throughout history starting with the Ancient Roman Empire who developed their own bathing culture in the location of today’s Budapest during the 1st to the 5th century. The spa scene in Hungary is a truly diverse system that builds from elements of various different styles and cultures creating an experience that’s just as indulging for the body as it is for the eyes. Enjoy a fast track entry to the largest spa of Europe and choose from a large variety of treatments and massages for the ultimate body and soul rejuvenating experience! I love Spa package includes the entrance ticket! Thermal massage 20 or 45 min. Aroma massage 20 or 45 min. Royal thermal massage 45 min. Thermal massage: The massage is mainly used for locomotive issues and disorders. The masseur finds the problematic areas and applies a personalized treatment for you. Aroma massage: A calming, gentle massage applied with slow and soft techniques. High quality, skin-friendly oils are used for a pampering experience. Its main purpose is relaxing the muscles. Hungaria Koncert help desk is located in the SZECHENYI BATH by the main entrance on the right-hand side (which is in front of the Circus). Check in is between 09:00–18:00. The facility closes at 22:00 and the guests stay until closing time. However, you have to arrive before 6 PM.